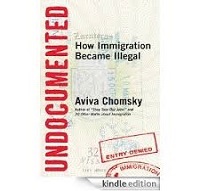 ​​​​​Latin Waves host Sylvia Richardson speak with immigrant rights activist Dr. Aviva Chomsky about her latest book Undocumented How Immigration Became Illegal. Dr. Chomsky speaks of how “illegality” and “undocumentedness” are concepts that were created to exclude and exploit. With a focus on US policy, she probes how people, especially Mexican and Central Americans, have been assigned this status—and to what ends. Blending history with human drama, She makes visible the legal, social, economic, and historical context and injustice that it perpetuates. This entry was posted in Uncategorized and tagged another world is possible, Aviva Chomsky, be the media, borders, community, dispatches, environment, Global Economic Crisis, global news, global warming, how to listen, immigration, international, internet, interviews, labor, latin waves media, latinwavesmedia, media, media democracy, media search engine, membership, movements, passion, political, politics, radio, social change, Stuart Richardson, Sylvia Richardson, Undocumented. Bookmark the permalink.